INTRODUCTION: Over the last few decades, the global environmental problem has attracted significant awareness of the research community and policymakers for the development of polymeric materials which are degradable in a natural environment. The production of biodegradable polymers which are decomposed by microorganisms and photodegradable polymers that are decomposed by sunlight is a priority among researchers. An ideal biodegradable polymeric material is one which after being disposed of can be recycled many times before promptly being decomposed by microorganisms or sunlight providing carbon dioxide and water. Chitosan is such a type of polymer which is degradable in natural environment. Chitosan is a polycationic naturally occurring bio-degradable, non-toxic, non-allergenic biopolysaccharide derived from chitin which is found in abundance in nature1-2. It contains more than 5000 glucosamine units and is obtained commercially from shrimp and crab shell containing chitin which is an N- acetyl glucosamine polymer. The N- acetyl glucosamine gets converted in to glucosamine units by alkaline de-acetylation with NaOH (with 40-50% conc. )3-5.Chitosan is considered as most promising materials for future applications on account of its excellent biodegradability, biocompatibility, non-toxicity, antimicrobial activity, and its economic advantages6. The chemical structure of chitin is made up of linear monomeric units of 2- acetamido-2-deoxy- D-glucopyranose attached through β-(1-4) linkages7. Chitin, the main source of chitosan is widely distributed both in the animal and the plant kingdom. Henry Braconnot (1780–1855) was the first who isolated chitin from mushrooms in 1811 about two centuries ago. It was the first polysaccharide which was identified by man preceeding by cellulose about 30 years8. The main sources of chitin are Fungi, Algae, Echiruda, Annelida (Segmented worms), Mollusca, Cnidaria (jellyfish), Aschelminthes (roundworm), Entoprocta, Bryozoa (Moss or lace animals, Phoronida (Horse shoe worms), Brachiopoda (Lamp shells), Arthropoda and Ponogophora. Chitin; also the major component of arthropods tendons, exoskeletons and the linings of their digestive, excretory and respiratory systems and insect’s external structure as well as of some fungi. It is also found in the iridophores (reflective material) of both eyes and epidermis of cephalopods and arthropods of phylum Mollusca and the epidermal cuticle of the vertebrates. Epidermal cuticle of Paralipophrystrigloides is also chitinous in nature9-11. Chitin occurs in three polymorphic solid state forms designated as α, β, and γ chitin which differ in their degree of hydration, size of unit cell, and number of chitin chains per unit cell12. Chains of chitin may be arranged in a tightly compacted crystalline structure of antiparallel sheets and extensive intermolecular hydrogen bonding (α-chitin), in a more mobile allomorph of parallel sheets (β-chitin), or a combination of both (γ-chitin) (Fig. 1). α-Chitin is most abundant and is found in shellfish exoskeletons and fungal cell walls. β-Chitin is mainly found in squid pens and diatoms while γ-chitin may be predominantly found in squid and cuttlefish stomach lining13-15. Chitosan is commercially interesting compounds because of its high nitrogen content (as compared to synthetically substituted cellulose) which makes chitosan a very useful chelating agent16.The elemental composition of chitosan17 is described in Table 1. Both chitin and chitosan have unusual multifunctional properties, including high tensile strength, bioactivity, biodegradability, biocompatibility, nontoxicity and non-antigenicity which made them possible to be used in many applications18-19. Furthermore, the chemical modifications of the three reactive functional groups of chitosan had increased the applications of chitosan in different fields. Chitosan has three reactive groups, which is primary (C-6) and secondary (C-3) hydroxyl groups (Fig. 2) on each repeat unit and the amino (C-2) group on each deacetylated unit. The presence of these reactive functional groups which may readily subject to chemical modifications to alter physico-mechanical properties of chitosan formulates it wonderful material for different purposed applications20. Chitosan, the deacetylation of chitin to form a soluble amine salts; is not a single chemical entity; it varies in composition depending on the source and method of preparation and also on physiological conditions. It is manufactured commercially by a chemical method; for example the isolation of chitin from shellfish waste consists of three steps: deproteinization (Extraction and/or removal of protein), demineralization, followed by the decolourization/de-pigmentation. The order of the first two steps is generally considered irrelevant if protein or pigment recovery is not an objective. 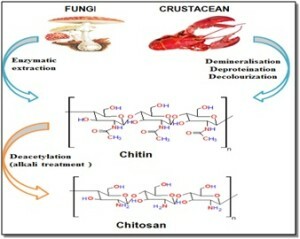 Several procedures for the preparation of chitin and chitosan from different shellfish wastes have been developed over the years, some of which form the basis of the chemical processes used for the industrial production of chitin and derivatives. Firstly the sources such as crab or shrimp shells are washed and grinded in to powdered form and then it is deproteinized by treatment with an aqueous 3-5% solution of sodium hydroxide. After that it is neutralized and demineralized at a room temperature by treating it with aqueous 3-5% of hydrochloric solution to form a white or slightly pink precipitate of chitin̍. After that chitin is deacetylated by treatment with an aqueous 40-45% solution of sodium hydroxide and the precipitate is then washed with water (Fig. 3). The insoluble part is removed by dissolving in an aqueous 2% acetic acids solution. The supernatant solution is then neutralized with an aqueous sodium hydroxide solution to obtain a purified chitosan21-22. Enzymatic methods are an alternative to the chemical method for chitin and chitosan production. In addition, the protein often remains high and reaction times are significantly increased compared to chemical methods. Enzymatic methods are limited in industrial production of chitosan, due to higher cost of enzymes. Several commercially available enzymes such as alcalase, chymotrypsin, and papain are also used for the production of chitosan23. Chitosan has attracted increasing attention in the past decade due to its unique properties including nontoxicity, biocompatibility, and biodegradation27-31 including many others discussed in the pending text. One; among the notable and much exploited is; its antimicrobial commotion inhibiting the growth of a wide variety of fungi, yeasts and bacteria making it beneficial for use in the field of biomedicine. It can also bind toxic metal ions, beneficial for use in air cleaning and water purification applications. These properties arise as a result of protonation of NH2 groups on the chitosan backbone24-26. Structurally, chitosan is a linear-chain copolymer composed of D-glucosamine and N-acetyl-D-glucosamine being obtained by the partial deacetylation of chitin. The structure of chitosan is very much similar to that of cellulose and is the second most abundant natural polymer after cellulose32-33. The solubility, biodegradability and reactivity of chitosan and adsorption of substrates depend on the extent of protonated amino groups in the chain of polymer. Chitosan is incapable of being dissolved in water, organic solvents and aqueous bases however get dissolved after stirring in acetic, nitric, hydrochloric, perchloric and phosphoric acids34. The amino group of chitosan is not protonated in alkaline or neutral medium and therefore it is insoluble in water; while in acidic pH it gets the resultant soluble protonated polysaccharide. Chitosan forms water-soluble salts with inorganic and organic acids including glyoxylate, pyruvate, tartarate, malate, malonate, citrate, acetate, lactate, glycolate, and ascorbate21, 35. Inherent chitosan becomes soluble in organic acids when the pH of the solution is less than 6.5. The water-soluble salts of chitosan may well be formed by neutralization with acids such as lactic acid, hydrochloric acid, acetic acid, or formic acid. 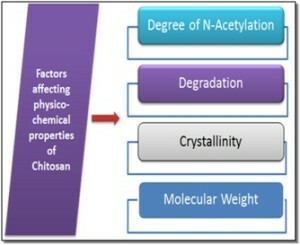 There are various other factors which may affect the physicochemical properties of chitosan (fig. 4) enabling the researchers to formulate different grades of chitosan which differ primarily in molecular weight, crystallinity and degree of deacetylation. During its processing from raw material, different conditions such as type and concentration of reagents, time and temperature employed can affect the physical characteristics of chitosan product. Its molecular weight also depends on solubility, viscosity, elasticity and tears strength. Chitosan is a pseudo plastic material and is an excellent viscosity-enhancing agent in acidic environments. The viscosity of chitosan solution is affected by the molecular weight, degree of deacetylation, pH, ionic strength, concentration, and the temperature. Generally, there is a decrease in the viscosity of the solution on the increase in temperature and increases with an increase in chitosan concentration. The effect of the pH on the viscosity depends on particular type of acid used37. The characteristics of chitosan required for a particular application are dependent upon the degree of acetylation (DA) and its molecular weight36. The degree of deacetylation of molecular chain of chitin; however, an extrinsic property; hence increased by increasing the temperature or strength of the alkaline solution. The viscosity of chitosan also influences the biological properties such as wound-healing properties as well as biodegradation by lysozyme. As the Chitosan is hydrophilic in nature, therefore it has the ability to form gels at acidic pH. This type of gels can be used as a slow-release drug-delivery system. The solubility of Chitosan can be decreased by cross-linking it with covalent bonds using glutaraldehyde. The swelling property of the chitosan decreases with an increase in the concentration of cross-linking agent21, 35. Þ Natural, linear polyamine with reactive amino and hydroxyl groups38-39. Þ Chelates with transitional metal ions40-41. Þ Biocompatible and biodegradable to normal body constituents42. Þ Non-toxic and safe to use43. Þ Binds to microbial and mammalian cells44. Þ Haemostatic, fungistatic and spermicidal agent45. Þ Antitumor and anti-inflamatory agent46. Þ Immunoadjuvant and drug delivery agent48-49. The use of chitosan has been postulated in numerous areas of biopharmaceutical research such as mucoadhesion, permeation enhancement, vaccine technology, gene therapy and wound healing. Recent applications of chitosan are in ophthalmic, nasal, sublingual, buccal, periodontal, gastrointestinal, colon-specific, vaginal, transdermal drug delivery and mucosal-vaccine and gene carrier. It can also be used in the pharmaceutical industry in direct tablet compression, as tablet disintegrant, for the production of controlled release solid dosage form or for the improvement of drug dissolution Chitosan derivatives were developed to improve not only biological activities but also water-soluble property, because the water-insoluble property was a major limiting factor for industrial application in spite of its unique biological aspects. Chitosan and its derivatives; having solubilities in pH values of lower than 6.0 are not desired for their use in cosmetics, medicine and food relevance51. In order to improve its solubility at neutral pH, firstly it is derivatized with substituents containing quaternary amino group, caboxymethylation and then sulfonation by adding strongly hydrophilic substituent52-53. The simplest derivative of chitosan is the trimethyl ammonium salt. The treatment of chitosan in N-methyl-2 pyrrolidone containing sodium iodide and methyl iodide with chloride ion in presence of sodium hydroxide resulting into the trimethyl ammonium salt of chitosan having high degree of substitution54. The anionic changes of iodide with chloride ions are necessary for stabilization resulting in water soluble product at neutral pH55. Graphene, a member of the family of carbon nanoscaled materials arranged in a honeycomb two-dimensional lattice is a single-atom-thick nano structured sheet; used as material in a diverse range of applications due to its intrinsic unique mechanical and electronic properties. Graphene exhibits unusual electronic conductivity, high specific surface area, high mechanical, thermal and chemical stabilities properties making it a suitable material for electrochemical catalysis and biosensing. To expand and optimize the use of graphene in the different applications in bio-technology, it is necessary to functionalize graphene with biomaterials such as chitosan and other polysaccharides. Recently Han and Yan (2014) have prepared supramolecular hydrogels of chitosan and GO by the non-covalent interactions between them where GO nanosheets work as 2D cross-linkers. At high GO concentration, hydrogel can be obtained at room temperature, while at low GO concentration, supramolecular hydrogel formed only at high temperature of 95 °C. These new kinds of hydrogels have potential applications in both biomaterials and environmental science as a smart soft material56. In the process of caboxyalkylation, there is introduction of an acidic group on backbone of the base polymer. Such derivatives of chitosan are amphoteric in characteristic due to the occurrence of the amino group. By using carboxyaldehyde in a reductive amination sequence which results in N- caboxyalkylation58, however, sequential substitutions giving rise to the formation of bis-carboxymethyl derivatives by using glyoxalic acid59. Water solubility for these derivatives is attained at pH values above or below the isoelectric point (pI, sometimes abbreviated to IEP, is the pH at which a particular molecule or surface carries no net electrical charge).In order to increase the water solubility of chitosan, Toh et al. grafted succinic acid onto chitosan reporting a higher solubility in water at pH 7.3 which is revealed through measuring of the cloud point (when 20 mol% of primary amine were converted into carboxylic acid)57. The grafting of carboxylic acids on the chitosan chains not only improved the transfection efficiency (involves opening transient pores or "holes" in the cell membrane, to allow the uptake of material) but directed to the formation of a weaker complex with DNA hence reducing the unexpected morphologies and abnormalities in target cells might be occurring because of a change in cell properties caused by introduction of DNA43. Since the N-phthaloylation of chitosan is a very important reaction for the design of innovative materials, as this reaction requires no organic solvents; a great contribute to the advancement of green chemistry. A highly chemo-selective N-phthaloyl chitosan was successfully prepared in aqueous acetic acid reaction media for the first time by Ifuku et al. (2011). Changes in the concentrations of aqueous acetic acid from 0-10% did not affect the structural regularity of the products. It should be emphasized that the irregular structure of the chitosan intermediate and acidic conditions caused by partial hydrolysis of phthalic anhydride allowed for a homogeneous reaction in pure water. It was also assumed that an N-acylation method is an eco-friendly aqueous media which would be applicable to any other cyclic acid anhydrides60. The implication of such derivatives in the form of membranes; the controlled permeability could be optimized by adjusting the substituting value of the chitosan, representing a significant potential application for these materials in agrochemicals61. Chitosan succinate and chitosan phthalate both the esters of chitosan have been successfully used as potential matrices for the colon-specific oral delivery of sodium diclofenac (a prescription medication which has been licensed to treat several conditions related to pain, inflammation, swelling, and stiffness). During the conversion from an amine to a succinate in the polymer matrix, the significant solubility profile changes were observed62. The implants of hydrophobic, biocompatible and biodegradable aliphatic polyester chains, and more particularly poly (e-caprolactone) chains, were investigated for the preparation of biocompatible and biodegradable chitosan based amphipathic grafted copolymers for formation of the nanoparticles63-66. These modified polymers are insoluble under acidic conditions and act as sustained release for the encapsulated agent under basic conditions as well as for colon-targeted system67-68. Ionotropic gelation methods are the most common to achieve a pharmaceutical product with desired characteristics. Super-paramagnetic iron oxide nanoparticles (SPIONPs) were encapsulated by Sanjaia, et al. at various concentrations within chitosan-triphosphate (SPIONPs-CS) using the ionotropic gelation method. Ionotropic gelation is based on the ability of polyelectrolytes counter ions to cross link to form hydrogels. Naturally occurring polysaccharides such as chitosan which have relevant use as biopolymers has been increased in the novel area such as hydrogel sustained release formulation, thus providing an eco-friendly pharmaceutical product development process. The dispersion ability of CS nanoparticles get enhanced by encapsulation of SPIONPs in aqueous solution, with all particles being lower than 130 nm in size and having high positive surface charge. The SPIONPs-CS nanoparticles exhibited super-paramagnetic properties at room temperature. These SPIONPs-CS nanoparticles can be applied as tissue-specific MRI contrast agents. This system has advantages over other MR agents in that preparation is simple, and can be undertaken under mild conditions. Furthermore, SPIONPs CS nanoparticles showed low cytotoxicity against skin fibroblast cells at proper concentrations, and excellent stability for over prolonged periods. These SPIONPs-CS nanoparticles have the potential to be utilized as a MR contrast agents in tissue environments in the human body69. The strong functionality of chitosan i.e. two hydroxyl groups and the one primary amine which can donate a free pair of electrons, make chitosan soluble in diluted aqueous acetic acid solvents and allow the formation of coordination bonds, offering a considerable opportunity of chemical modification. The modification of chitosan chains (hydrophilic in nature) with hydrophobic compounds such as carboxylic acids including fatty acids can results in the products with an amphiphilic nature. Such amphilic chitosan derivatives are able to self- assemble and form nano particles (micelles) under appropriate conditions. Grafting of fatty acids such as, saturated stearic acid70-73 and unsaturated lineoic acid74-75 are two examples successfully grafted onto chitosan oligomers. With this purpose, the carboxylic acid of oleic acid was first converted into acid chloride by Zhang et al.76. Using a similar strategy, Jiang et al. grafted stearic, palmitic, or octanoic anhydride onto chitosan77. Quantum dots (QDs) are the semiconductor nanoparticles in the size range of 2-6nm are being studied extensively. Their biological applications are not only because of their size dependent properties but also because of their dimensional similarities with biological macromolecules such as chitosan. Li et al. have synthesised derivatives of CdS Quantum dots with improved aqueous solubility and stability of chitosan. The thermal decomposition of chitosan also gets influenced by these CdS Quantum dots. In the presence of these quantum dots thermal decomposition of chitosan was shifted to 50°C. 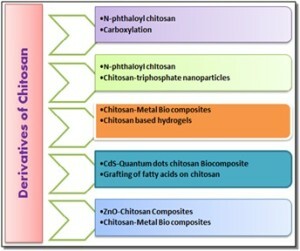 An efficient procedure for the preparation of CdS QDs chitosan biocomposite is achieved by mixing chitosan with Cd(Ac)2 and subsequently dissolving in one percent HAc aquous solution followed by treatment with CdS and thus smooth, flat, yellow CdS QDs chitosan composite films were obtained78. A novel bio functionalized CdS quantum dots conjugates were synthesized in aqueous media using chitosan and N-acylated chitosan as ligands via a single-step colloidal process79. Existing commercial sorbents including, activated carbon, zeolites, activated alumina, and silica gels play important roles in adsorptive separation and purification. Recently Shafiq, et al. synthesised the chitosan composites containing different concentrations of ZnO using sol-cast transformation method. Chemical interactions between the chitosan and ZnO in the composites that became more evident at higher concentrations of filler. The composites exhibited significantly lower degradation rate and higher thermal stability than that of chitosan. These composites exhibited biocidal activity to gram positive and gram negative bacteria80. Chelatant amino polymers like chitosan have a low efficiency in metal uptake in the acidic pH range (due to the protonation of the amino groups). More- over, the amino polymers, like chitosan, are soluble in acidic media and therefore cannot be used as sorbents in these conditions. However, their activity is as the strong cation exchanger can be improved by derivatizing chitosan with N-benzyl sulfonate for the removal of metal ions as sorbents in acidic medium. These sulfonated derivatives leads to the adsorption of heavy metals(Cd2+, Zn2+, Ni2+, Pb2+, Cu2+, Fe3+, and Cr3+). Chitosan was reacted with 2-formylbenzene sodium sulfonate and 4- formyl benzene sodium disulfonate in the presence of sodium cyano borohydride to yield N-benzyl derivatives81. Weltrowski et al. reacted Chitosan with 8-formyl benzene sodium sulfonate and 4-formyl-1,3-benzene sodium disulfonate in the presence of NaCNBH3 to yield N-benzyl mono- and disulfonate derivatives of chitosan. The disulfonate compounds showed better sorption capacities than for monosulfonate compounds. This phenomenon is attributed to the amphoteric character of the monosulfonate derivatives. The sorption capacity of monosulphonated compounds were improved by protecting the amino group by benzyl oxycarbonyl. The protection of amino group of disulphonated derivative by the same group (benzyl oxycarbonyl) also improves its efficiency for heavy metal sorption. The synthesized sulfonate derivatives of chitosan are especially adapted to the sorption of heavy metals from the acidic industrial effluents82. Aromatic aldehydes were reacted with Chitosan by reductive amination involving formation of the corresponding imines, followed by reduction with sodium borohydride to produce the N-(benzyl) chitosan derivatives. Rabea et al. evaluated the antibacterial activity in vitro against the crown gall disease Agrobacterium tumefaciens and the soft mold disease Erwiniacarotovora by the nutrient agar dilution method. They also obtained a higher activity of chitosan and its derivatives with N-(o-ethylbenzyl) chitosan with a MIC of 500 mg/L against E. carotovora, while N-(o,p-diethoxybenzyl) chitosan was the most active one against A. tumefaciens. Most of these derivatives exhibited high inhibition percentage (>90%) of spore germination83. Quercetin has been successfully encapsulated in lecithin/chitosan nanoparticles using the self-assembly technique by Marthyna P. Souza et al. (2014). Their study showed that Quercetin-Nanoparticle is stable to temperature of 5 to 70 °C and pH variations in values ranging between 3.3 and 5.0. NP’s stored at 4°C showed resistance to aggregation for 90 days and stability to retention of quercetin concentration for 40 days. Quercetin-Np can be used as an ingredient of functional foods or as an alternative in the defence against free radicals damaging foods in hydrophilic environments. The features presented by these types of nanoparticles make them attractive not only for the food industry, but can also be useful for cosmetic and pharmaceutical industries84. Chitosan biopolymers have a great potential in biomedical applications, due to their biocompatibility and biodegradability. However, the low physical properties of chitosan limit its applications. The development of high performance chitosan biopolymers involves the incorporation of fillers that display significant mechanical reinforcement85. Polymer nanocomposite has been reinforced by nano-sized particles with a high surface area to volume ratio, including nanoparticles, nanoplatelets, nanofibers and carbon nanotubes. Nowadays, carbon nanotubes are considered as potential fillers, as they improve the properties of biopolymers86. To optimize the use of CNT for biological applications it is necessary to functionalise CNT with biomaterials such as bio-molecules or biopolymers. Based on such reports, the researchers assessed the effect of CNT fillers in the chitosan matrix, and evidenced the appropriate properties of CNT/chitosan nano-biocomposite with a high potential for biomedical applications87. Acid functionalized single walled carbon nanotubes were covalently grafted to chitosan by first reacting with oxidized carbon nanotubes with thionyl chloride to form acyl-chlorinated carbon nanotubes which are subsequently dispersed in chitosan and covalently grated to form composite material, CNT–chitosan. The incorporation of CNTs in chitosan has been shown to improve the thermal properties of the CNT–chitosan88. Azeez et al. (2013) have prepared cryomilled multiwall carbon nanotube (MWCNT) reinforced chitosan nanocomposites having improved conductivity by solution casting method. The cryomilled CNTs were chemically oxidized by both acidic and basic methods, where basic oxidation lead to the generation of high graphitic structure. The conductivity of the nanocomposites was improved by cryomilling and it was further improved by chemical oxidation. Base oxidized cryomilled CNT/chitosan nanocomposite showed large improvement in conductivity compared to all other nanocomposite having 1 wt. % CNT content. Thermal stability and tensile properties of the CNT/chitosan nanocomposite also have been improved significantly by the incorporation of acid and base oxidized cryomilled CNTs89. Multi-walled carbon nanotubes (MWCNTs) were used as doping material by Carolin Lau et al. for three-dimensional chitosan scaffolds to develop a highly conducting, porous, and biocompatible composite material. 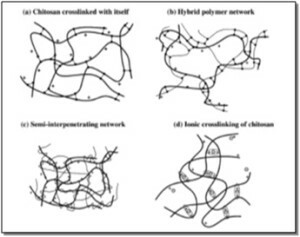 When MWCNTs were used as a ﬁller to introduce conductive pathways throughout the chitosan skeleton, the solubilizing hydrophilic and hydrophobic properties of chitosan established stable polymer/MWCNT solutions that yielded a homogeneous distribution of nanotubes throughout the ﬁnal composite matrix90. Chitosan composites are the novel material that exhibits good sorption behaviour toward various toxic pollutants in aqueous solution. These composites have a speedy adsorption rate and soaring efficiency to remove various pollutants and are easy to recover and reuse. These features highlight the suitability of composites for the treatment of water polluted with metal and organic materials.Since ancient times, metallic elements such as gold and silver have been used extensively as fillers for synthetic or natural matrix91. Magnetic Chitosan Composites (MCCs) are among these series to do perform such innovative job together with the antimicrobial and antibacterial activities. Researchers have developed a biosensor based on the gold nano particles (Au)–Cs sol–gel composites to detect various types of a specific electrode. The Au provided a conductive pathway for electron transfer and improved electrochemical reactions at a lower potential92-93. At the same time, Au permits direct electron transfer between immobilized enzyme and targeted electrode and allowed electrochemical sensing to be performed without the need for electron transfer mediation94. The advantage of Ag/Cs composites over Au/Cs composite is the antibiotic or antimicrobial properties of Ag particles95-96. Ag has been reported to induce generation of intracellular reactive oxygen species in bacterial cells97. The Ag ion enters the bacterial cells, makes pores on the cell walls, releasing the cytoplasmic content to the medium and consequently, leads to cell death without affecting the intracellular and extracellular proteins and nucleic acids of the bacteria98-100. The researchers are much interested in the utilization of agricultural wastes such as corn cob123, palm kennel shell124, coconut shell125-126 and chitosan127 to produce biocomposites that reduces cost as well as enhance the properties and biodegradability of biocomposites. Corn (Zeya mays) is a biomass resource that is cultivated around the world which during its processing yields corn cob, natural filler in polymer can give rise to economic advantages. Yeng and his co-workers in 2013 synthesised a chitosan biocomposite film by using corn cob as filler. The incorporation of corn cob in chitosan biocomposite films was found with improved the modulus of elasticity, but tensile strength and elongation at break decreased. Its treatment with acetic acid enhanced the mechanical properties of biocomposite this films. The treated Chitosan-Corn Cob biocomposite films have higher tensile strength and elongation at break compared to untreated. The treated biocomposite films exhibited better thermal stability than untreated biocomposite films101. Bentonite is a common group of clay minerals, which is a hydrous aluminium silicate, and it has been reported as an economical material for adsorption of fluoride from water. Chitosan has been cited as an excellent material for defluoridation from water. However, raw chitosan used in the form of flakes or powder is unstable and the adsorption capacity reported is minimum, thus, it is necessary to modify chitosan physically or chemically in order to improve its practical uses. Recently Zhang et al. has synthesized a new adsorbent namely bentonite/chitosan beads for its defluoridation efficiency. Bentonite was activated and the beads were prepared by using the inverse suspension polymerization method. The adsorption of fluoride onto the adsorbent followed Freundlich isotherm model and pseudo-second order kinetic model. The fluoride loaded adsorbent could be regenerated using sodium hydroxide. Bentonite/chitosan beads are of low-cost, effective and reusable adsorbent for adsorption of fluoride102. Chitosan shows a degradation temperature lower than its melting point, which prevents its development in several applications. One way to overcome this issue is the plasticization of the polysaccharides. Different plasticizers such glycerol, sorbitol, sucrose and polyethylene glycol were tested with chitosan as the plasticizing agent. Plasticized chitosan with hierarchical structure, including multiple length scale structural units, was prepared by a “melt”-based method, that is, thermo-mechanical mixing, as opposed to the usual casting-evaporation procedure. Chitosan was successfully plasticized by thermo-mechanical mixing in the presence of concentrated lactic acid and glycerol using a batch mixer. Concentrated lactic acid was used as protonation agent as well as plasticizer. The thermo-mechanically plasticized chitosan obtained was actually a composite material in which the amorphous phase was reinforced by nanoﬁbrils, nanoﬁbril clusters, and microﬁbers. With an increase in plasticizer content the crystallinity of the plasticized chitosan decreased from 63.7% for the original chitosan powder to 43.0% and then further to almost a completely amorphous phase for the sample plasticized with extra water. Thermo-mechanical plasticization can be a promising way to plasticize chitosan on an industrial scale103. These materials may also be promising for tissue engineering applications to elaborate 2D or 3D scaffolds, considering the antibacterial activity of chitosan. Hydrogel (also called aquagel) is a network of polymer chains that are hydrophilic, sometimes found as a colloidal gel in which water is the dispersion medium. Hydrogels are highly absorbent (they can contain over 99.9% water) natural or synthetic polymers. Hydrogels also possess a degree of flexibility very similar to natural tissue, due to their significant water content. Hydogels based on covalently cross-linked chitosan can be divided into three types with respect to their structure: chitosan cross-linked with itself (Fig. 7a), hybrid polymer networks (HPN) (Fig. 7b) and semi- or full-interpenetrating polymer networks (IPN) (Fig. 7c). The simplest structure presented here is chitosan cross-linked with it. As represented in (Fig. 7a), crosslinking involves two structural units that may or may not belong to the same chitosan polymeric chain104. The final structure of such a hydrogel could be considered as a cross-linked gel network dissolved in a second entangled network formed by chitosan chains of restricted mobility105. In hydrogels formed by a HPN, the crosslinking reaction occurs between a structural unit of a chitosan chain and a structural unit of a polymeric chain of another type (Fig. 7b), even if crosslinking of two structural units of the same type and/or belonging to the same polymeric chain cannot be excluded. Finally, semi- or full- IPNs contain a non-reacting polymer added to the chitosan solution before crosslinking. This leads to the formation of a cross-linked chitosan network in which the non-reacting polymer is entrapped (semi-IPN). It is also possible to further crosslink this additional polymer in order to have two entangled cross-linked networks forming a full-IPN, whose microstructure and properties can be quite different from its corresponding semi-IPN106. Semi and full interpenetrating polymer network (IPN) type hydrogels were prepared by free radical in situ polymerization of methacrylic acid in presence of chitosan using N, N methylene-bis-acrylamide (MBA) and glutaraldehyde (for full IPN) as cross-linker. Several semi and full IPN type hydrogels were prepared by varying initiator and cross-linker concentration and also monomer to chitosan mass ratio. These hydrogels were characterized and used for removal of methyl violet and congo red dye from water. Isotherms and kinetics of dye adsorption were also evaluated JayabrataMaity, et al.107. Recently Abdel kaderDilmi and et al. prepared a hydrogel which consists of hydroxy ethyl methacrylate and chitosan, and investigated its swelling kinetics and ibuprofen release. In their work, it was found that swelling capacity decreased when the chitosan concentration was increased, most probably because of changes in the hydrogel porosity. This, in turn, caused an increase in the cross-linking density and the hydrophobicity of chitosan, thus reducing the hydrophilicity of the hydrogel. Furthermore, the swelling process followed second-order kinetics, while ibuprofen diffusion into the hydrogel showed Fickian behaviour in their study108. The novel hydrogels (termed HCD hydrogels) were synthesized based on human-like collagen (HLC) and chitosan (CS) cross-linked with dialdehyde starch (DAS). The biological stability and biocompatibility of HCD hydrogels were determined through in vitro and in vivo tests. The mechanism of hydrogel formation showed that covalent bonds formed via acetalization and Schiff base reactions. HCD hydrogels afford both enhanced biological stability and excellent biocompatibility, making them potentially promising for skin patch scaffolds, wrinkle treatments, and tissue cavity fillers109. A standard technique was used by Sowmya Ramesh, et al. which involves the cross-linking of chitosan and hyaluronic acid at 2:1 (w/w). In this modiﬁed technique, cells were initially added to 33 % of hyaluronic acid dialdehyde and the gelation process was completed with the remaining 67 %. This minimised the cell loss and improved the encapsulation of the cells. After 20 days, the modiﬁed technique showed better seeding density, with matrix synthesis (per scaffold) of 11µg as compared to 1.1µg in the current technique. The modiﬁed technique was superior for matrix synthesis and maintenance of phenotype110. Another approach to improve the properties of chitosan hydrogels is via the preparation of chitosan composites. Porous hydrogels of N-carboxymethyl chitosan/polyvinyl alcohol were prepared by Lee et al.111. Hydroxy-propyl chitosan was combined with sodium alginate for the formation of biodegradable hydrogels112-113. Increasing consumer demand for microbiologically safer foods, greater convenience, smaller packages, and longer product shelf life is forcing the industry to develop new food-processing, cooking, handling, and packaging strategies. During the last few decades, there is an increase in interest to develop and use bio-polymer based active or edible ﬁlms for food packaging applications which are not only of natural origin but can also enhance food safety, quality during storage i.e. length of time it is stored and be pretty helpful to reduce the use of chemical preservatives, where the packaging material is a means of providing the correct environmental conditions for food during and/or distributed to the consumer. A good package has to perform the following functions like it must keep the product clean and provide a barrier against dirt and other contaminants. It should prevent losses. Its design should provide protection and convenience in handling, during transport, distribution and marketing. In particular, the size, shape and weight of the packages must be considered. It should also provide protection to the food against physical and chemical damage (e.g. water and water vapour, oxidation, light) and insects and rodents. It must provide identification and instruction so that the food is used correctly and have sales appeal. The increased attention for chitosan applications in the food industry is being readily considered due to its several distinctive biological activities and functional properties. As chitosan belongs to very interesting family of β-(1-4) linked polysaccharides; this kind of glycosidic linkage leads to relatively extended and rigid structures in the solid, particularly in the dry state and as a consequence, this biopolymer similar to cellulose possess a good film forming capability114. The positively charged groups on chitosan interact with opposite charged groups of the solvent yielding three-dimensional networks115. The chemical structure of CS has been exploited for its innovative features in biotechnology and medicinal field. The presence of free amino group within molecule makes it highly interesting for immobilization of bioactive substances. This is where the modification of Chitosan in the form of its derivatives become highly attractive for assorted applications. Chitosan can be used against a broad spectrum of target organisms like bacteria, fungi, viruses or algae. Microbial growth on the surface of food is a major cause of food spoilage and food-borne illness. Chitosan possesses unique properties that make it an ideal ingredient for development of antimicrobial edible film. Antimicrobial character of chitosan is due to its positively charged amino group which interacts with negatively charged microbial cell membrane leads to the leakage of proteinaceous and other intracellular constituents of the microorganisms making it an extraordinary material for food packaging substance. Chitosan and its derivatives have significant potential in the food industry in view of contaminations associated with food products and the increasing concerns in relation with the negative environmental impact of conventional packaging materials such as plastics. The biopolymer-based edible films for food packaging are generally characterized by several parameters, including mechanical properties (elongation, tensile strength and breaking force), thickness, water vapour and oxygen permeability, as well as moisture content and colour evaluations. Chitosan films are tough, long-lasting, flexible and very difficult to tear. They also possess moderate water vapour permeability values and could be used to increase the storage life of fresh foodstuffs with higher water activity values116-117 and also exhibit an excellent barrier to oxygen permeation118. Chitosan also offers real potential for applications in the food industry due to its particular properties like physico-chemical, biodegradability and its biocompatibility with the human tissues, antifungal and antimicrobial activities. Due to these properties, chitosan and its derivatives based films have attracted more attention in food preservation and food packaging technology119. Chitosan shows particular interest over synthetic polymers, because it is Generally Recognized as Safe (GRAS) by Food and Drug Administration (FDA). This is mainly due to high antimicrobial activity of chitosan against pathogenic and spoilage micro-organisms, including fungi and both Gram-positive and Gram-negative bacteria120. Designing and manufacturing of packaging materials (Fig.8) is a multistep process and involves careful and numerous considerations to successfully engineer the final package with all the required properties. FIG.8. A MULTISTEP APPROACH REQUIRE FOR DESIGNING AND MANUFACTURING OF BIO BASED PACKAGES AND PACKAGING MATERIALS. Abundant researches have clearly demonstrated that chitosan can be used as an effective preservative or coating material for improvement of quality and shelf life of various foods. Chitosan had been approved as a food additive in Korea and Japan since 1995 and 1983, respectively. In the United States, upon receiving the US FDA approval for GRAS status, chitosan as a food additive and its applications in food systems will certainly be in more demand in the near future, however much research is still needed to evaluate feasibility of using various chitosan and its oligomers products prepared from simplified production processes for specific food usage. TABLE. 2 FOOD APPLICATIONS OF CHITOSAN AND THEIR DERIVATIVES IN FOOD INDUSTRY117. CONCLUSION: Chitosan and its derivatives exhibit a variety of physicochemical and biological properties resulting in numerous worldwide applications in areas ranging from pharmaceutical, biomedical, dentistry, food industry, waste water treatment, agrochemical, environmental and industrial uses. Their derivatization is contributed towards the expansion of its applications also decreasing toxicity. Because of its antimicrobial properties, chitosan is especially a promising material for food packaging. Antimicrobial activity of chitosan is related to its cationic nature, and has been successfully explored to extend shelf life of a variety of foods. Chitosan has three reactive functional groups, the amino (C-2) group and the primary (C-6) and the secondary (C-3) hydroxyl groups on each monomeric unit on each deacetylated unit. These reactive functional groups are readily subject to chemical modifications to change its physico-mechanical properties. The incorporation of other natural antimicrobials or antioxidative agents in chitosan films can also improve its antimicrobial activities due to which the shelf life of food can be increased. Natural plant extracts could act as both an antimicrobial agent and as an odour/flavour enhancer. As the conventional food packaging leads to serious environmental issues due to their non-degradability; improperly disposed plastic material is a significant source of environmental pollution. Though there are many papers focused on chitosan and its derivatives, there are still extensive reviewing studies of recent advancements in the chitosan based derivatives needed to be compiled. Examination of better ways to incorporate these derivate products into Everyday Life Management strategies remains to be pursued. Interesting theoretical and applied findings are assembled in recent years, whereas more are needed to examine the mechanisms governing the mode of action of these derivatives when applied at large scales. In the case of antimicrobial mode of action to work as the food covering material or packaging material, future work should aim at clarifying the molecular details of the underlying mechanisms and their relevance to the antimicrobial activity of chitosan. Moreover, further investigations in this area, in particular with regard to microorganism resistance mechanisms against this compound, are reasonable justified and moreover warranted. It is clear that the future will bring a lot of new developments in the area with special focus on the use of biopolymer as matrices in the development of natural and biologically derived antimicrobial agents for increasing efficiency and speciﬁcity in food industry. As one looks to the future, chitosan based derivatives used in food packaging are likely to evolve considerably. Further our current understanding of fundamental properties of chitosan may enable future advances in antimicrobial food packaging. ACKNOWLEDGEMENT: We are thankful to the administration of Jamia Millia Islamia, New Delhi, for providing infrastructures and internet facilities to write this Review. The first author, Shakeel Ahmedgratefully acknowledges financial support from the University Grants Commission (UGC) New Delhi in the form ofjunior research fellowship. Malviya R, Srivastava P, Bansal, M and Sharma P.K: Preparation and Evaluation of Disintegrating Properties of Cucurbita maxima Pulp Powder. International J. Pharmaceutical Sci. 2010; 2(1): 395-399. Chandur VK, Badiger AM, Shambashiva Rao KRS: Characterizing formulations containing derivatized chitosan with polymer blending. IJRPC. 2011; 1(4): 950-967. Goosen MFA: Applications of Chitin and Chitosan. Technomic Publishing Co., Inc.: Lancaster, PA, 1997. Han LK, Kimura Y,and Okaauda H: Reduction in fat storage during chitin chitosan treatment in mice fed a high fat diet. Int. J. Obes. Relat. Metab. Disord.1999;23: 174-179. Liu XF, Guan YL, Yang DZ, Li Z and Yao KD: Antibacterial action of chitosan and carboxymethylated chitosan. J. Appl. Polym. Sci. 2001; 79: 1324. Ahmed S, Ahmad M and Ikram S: Chitosan: A Natural Antimicrobial Agent- A Review. Journal of Applicable Chemistry. 2014; 3 (2): 493-503. Muzzarelli RAA: Enzymatic synthesis of chitin and chitosan. Occurrence of chitin. Pregamon Press, New York, NY, (Muzzarelli, R.A.A., ed. ), 1977: 5-44. Herring PJ: Marine Ecology and natural products. Pure appl. chem.1979; 51: 1901-1911. Wagner GP, Lo J, Laine R and Almeder M: Chitin in the epidermal cuticle of a vertebrate. Cell mol. life sci. 1993; 4: 317-319. Einbu A: Characterisation of chitin and a study of its acid-catalysed hydrolysis. PhD dissertation, Norwegian University of Science and Technology, Trondheim, Norway.2007. Carlstrom D: The crystal structure of alpha-chitin (poly-N-acetyl-d-glucosamine). J. Biophys Biochem Cytol. 1957; 3: 669-683. Gooday GW: The ecology of chitin degradation. In: Advances in Microbial Ecology, ed. K.C. Marschall, New York: Academic Press. 1990: 387-440. Kurita K: Controlled functionalization of the polysaccharide chitin. ProgPolym Sci. 2001; 26:1921-1971. Rudrapatnam N, Kittur T and Kittur FS: Chitin-the undisputed biomolecule of great potential. Crit Rev Food SciNutr. 2002; 43: 61-87. Muzzarelli RAA: Natural Chelating Polymers (Pergamon Press, New York), 1973: 83. Tian F, Liu Y, Hu KA: Study of the depolymerization behavior of chitosan by hydrogen peroxide. Carbohydr Polym, 2004; 57: 31-37. Simpson BK, Gagne N and Simpson MV: Bioprocessing of chitin and chitosan. In A. M. Martin (Ed. ), Fisheries Processing: Biotechnological Applications, London U.K. Chapman and Hall. 1994: 155-173. Tharanathan RN, Kittur FS: Chitin-the undisrupted biomolecule of great potential. Critical Reviews in Food Science and Nutrition. 2003; 43: 61-87. Badawy MEI and Rabea EIA: Biopolymer Chitosan and Its Derivatives as Promising Antimicrobial Agents against Plant Pathogens and Their Applications in Crop Protection. International Journal of Carbohydrate Chemistry. 2011: 1-29. Bansal V, Sharma PK, Sharma N, Pal OP and Malviya R: Applications of Chitosan and Chitosan Derivatives in Drug Delivery. Advances in Biological Research. 2011; 5, 1: 28-37. Percot A, Viton C and Domard A: Optimization of chitin extraction from shrimp shells. Biomacromolecules. 2003; 4: 12-18. Sun K, Li ZH: Preparations, properties and applications of chitosan based nanofibers fabricated by electrospinning. Express Polymer Letters. 2011; 5, 4: 342–361. Angelova N, Manolova N, Rashkov I, Maximova V, Bogdanova S, Domard A: Preparation and properties of modified chitosan films for drug release. Journal of Bioactive and Compatible Polymers. 1995; 10: 285–298. Selmer-Olsen E, Ratnaweera HC, Pehrson R: A novel treatment process for dairy wastewater with chitosan produced from shrimp-shell waste. Water Science and Technology. 1996; 34: 33–40. Dong YM, Qiu BW, Ruan HY, Wu SY, Wang MA and Xu CY: Chemical Syntheses of the Conducting Material Formed by Heteropolyacids and Polyaniline Polymer Journal. 2001; 33: 387-389. Shigemasa Y and Minami S: Applications of Chitin and Chitosan for Biomaterials. Biotechnology and Genetic Engineering Reviews.1995; 13: 383-420. Karlsen J and Skaugrud O: Excipient properties of Chitosan. Manufacturing Chemist. 1991; 62: 18. Payne GF, W Sun Q and Sohrabi: A. Tyrosinase reaction/chitosan adsorption for selectively removing phenols from aqueous mixtures. Biotechnology and Bioengineering. 1992; 40: 1011-1018. Dee JD, Rhode O, Wachter R: Chitosan multifunctional marine polymer. Cosmetics and Toiletries. 2001; 116: 39-44. No HK, Meyers SP and Lee KS: Isolation and Characterization of Chitin from Crawfish Shell Waste. Journal of Agricultural and Food Chemistry. 1989; 37: 575-579.
deAlvarenga ES: Characterization and Properties of Chitosan, Biotechnology of Biopolymers, Prof. MagdyElnashar (Ed. ), 2011, ISBN: 978-953-307-179-4, InTech. Irom BC, Kavitha K, Rupeshkumar M and Jagadeesh Singh SD: Applications of Natural Polymer Chitosan and Chitosan Derivatives in Drug Delivery: A Review. RJPBCS. 2012; 3, 4: 309-316. Rabea EI, Badawy MET, Stevens CV, Smagghe G and Steurbaut, W: Chitosan as antimicrobial agent: applications and mode of action. Biomacromolecules. 2003; 4, 6: 1457-1465. Dasha M, Chiellinia F, Ottenbriteb RM and Chiellinia E: Chitosan-A versatile semi-synthetic polymer in biomedical applications. Progress in Polymer Science. 2011; 36: 981-1014. Rhazi M, Desbrières J, Tolaimate A, Rinaudo M, Vottero, P and Alagui, A: Polymer. 2002; 43:1267. Modrzejewska Z, Dorabialska M, Zarzycki R and Wojtasz-Pająk A: The Mechanism Of Sorption Of Ag+ Ions On Chitosan Microgranules: Ir and Nmr Studies. Progress on Chemistry and Application of Chitin and its Derivatives. 2009; 14: 49-64. Krajewska B: Diffusion of metal ions through gel chitosan membranes. 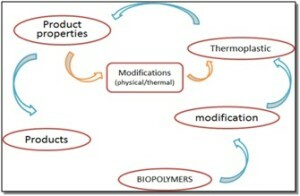 Reactive & Functional Polymers. 2001; 47: 37-47. Zheng L and Cui HF: Use of chitosan conduit combined with bone marrow mesenchymal stem cells for promoting peripheral nerve regeneration. J. Mater. Sci. Mater. Med. 2010; 21: 1713-1720. SarathChandran C, ArunShirwaikar A, Sarala Devi and Kiron SS: Development and Evaluation of Chitosan Ocuserts Containing Ciprofloxacin-β CD Complex. International Journal of PharmTech Research. 2010; 2, 1: 246-252. Xiaa W, Liuc P, Zhanga J and Chen,J. Biological activities of chitosan and chitooligosaccharides. Food Hydrocolloids. 2010; 30: 1-10. Ezoddini-Ardakani F, Navabazam A, Fatehi F, Danesh-Ardekani M, Khadem S and Rouhi G: Histologic evaluation of chitosan as an accelerator of bone regeneration in microdrilled rat tibias. Dent Res J (Isfahan). 2012; 9(6): 694–699. Nishimura K, Nishimura S, Nishi N, Saiki I, Tokura S and Azuma I: Immunological activity of chitin and its derivatives. Vaccine. 1984; 2(1): 93-99. 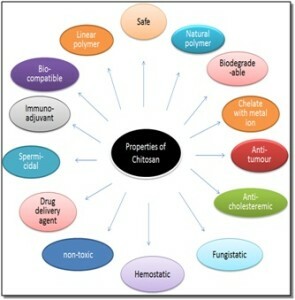 Mourya VK, Inamdar NN: Chitosan-modifications and applications: Opportunities galore. Reactive & Functional Polymers. 2008; 68: 1013-1051. Sakurai K, Maegawa T and Takahashi T: Glass transition temperature of chitosan and miscibility of chitosan/poly (N-vinyl pyrrolidoane) blends. Polymer. 2000; 41: 7051-7056. Anthonsen MW, Smidsrod O: Hydrogen ion titration of chitosans with varying degrees of N-acetylation by monitoring induced 1H-NMR chemical shifts. CarbohydrPolym. 1995; 26, 4: 303-305. Hjerde RJ, Varum KM, Grasdalen H, Tokura S and Smidsrod O: Chemical composition of O-(carboxymethyl)-chitins in relation to lysozyme degradation rates. Carbohydr Polymer.1997; 34: 131-139. Domard A, Rinaudo M and Terrassin C: 13C and 1H NMR spectroscopy of chitosan and N-trimethyl chloride derivatives. Int J BiolMacromol. 1986; 8: 105-107. Thanou M, Florea BI, Geldof M, Junginger HE and Borchard, G: Quaternized chitosan oligomers as novel gene delivery vectors in epithelial cell lines. Biomaterials. 2002; 23, 1:153-159. Han D and Yan L: Supramolecular Hydrogel of Chitosan in the Presence of Graphene Oxide Nanosheets as 2D Cross-Linkers. ACS Sustainable Chem. Eng. 2014; 2: 296−300. Toh EKW, Chen HY, et al. : Succinated chitosan as a gene carrier for improved chitosan solubility and gene transfection. Nanomedicine. 2011; 7, 2: 174–183. Kim CH and Choi KS: Synthesis and Properties of Carboxyalkyl Chitosan Derivatives. J Ind.Eng. Chem. 1998; 4: 1-19. Liu XF, Guan YL, Yang DZ, Li Z and Yao, KD: Antibacterial action of chitosan and carboxymethylated chitosan. J. Appl. Polym. Sci. 2001; 79: 1324. Ifuku S, Miwa T, Morimoto M and Saimoto, H: Preparation of highly chemoselective N-phthaloyl chitosan in aqueous media. Green Chem. 2011, 13: 1499-1502. Chen C, Tao S, Qiu X, Ren, X and Hu S: Long-alkane-chain modified N-phthaloyl chitosan membranes with controlled permeability. Carbohydr. Polym. 2013; 91, 1: 269-276. Aiedeh K and Taha MO: Synthesis of iron-cross-linked chitosan succinate and iron-cross-linked hydroxamated chitosan succinate and their in-vitro evaluation as potential matrix materials for oral theophylline sustained-release beads. Eur J Pharm Sci. 2001; 13(2): 159-168. Liu Y, Tian and, Hu KA: Synthesis and characterization of a brush-like copolymer of polylactide grafted onto chitosan. Carbohydr. Res. 2004; 339: 845–851. Liu L, Li Y, Liu H and Fang Y: Synthesis and characterization of chitosan-graft-polycaprolactone copolymers. Eur. Polym J. 2004; 40: 2739–2744. Wu H, Wang S, Fang H, Zan X, Zhang J and Wan Y: Chitosan-polycaprolactone copolymer microspheres for transforming growth factor-[beta]1 delivery. Colloids Surf B. 2011; 82: 602–608. Duan K, Zhang X, Tang X, Yu J, Liu S, Wang D, Li Y, Huang J: Fabrication of cationic nanomicelle from chitosan-graftpolycaprolactone as the carrier of 7-ethyl-10-hydroxy-camptothecin. Colloids Surf B. 2010; 76: 475-482. Shaji J, Jain V and Lodha S: Chitosan: A Novel Pharmaceutical Excipient. International Journal of Pharmaceutical and Applied Sciences. 2010; 1(1):11-28. Sanjaia C, Kothana S, Gonilb P, Saesoob S and Sajomsang W: Chitosan-triphosphate nanoparticles for encapsulation ofsuper-paramagnetic iron oxide as an MRI contrast agent. Carbohydrate Polymers. 2014; 104: 231-237. Du YZ, Lu P, Zhou JP, Yuan H and Hu FQ: Stearic acid grafted chitosan oligosaccharide micelle as a promising vector for gene delivery system: factors affecting the complexation. Int J Pharm. 2010; 391: 260-266. Ye YQ, Yang FL, Hu FQ, Du YZ, Yuan H and Yu HY: Core-modified chitosan-based polymeric micelles for controlled release of doxorubicin. Int J Pharm. 2008; 352: 294-301. Li Q, Du YZ and Yuan H: Synthesis of Lamivudine stearate and antiviral activity of stearic acid-g-chitosan oligosaccharide polymeric micelles delivery system. Eur J Pharm Sci. 2010; 41: 498-507. Hu FQ, Wu XL, Du YZ, You J and Yuan H; Cellular uptake and cytotoxicity of shell crosslinked stearic acid grafted chitosan oligosaccharide micelles encapsulating doxorubicin. Eur J Pharm Biopharm. 2008; 69: 117-125. Du YZ, Wang L, Yuan H, Hu FQ; Linoleic acid-grafted chitosan oligosaccharide micelles for intracellular drug delivery and reverse drug resistance of tumor cells. Int J BiolMacromol. 2011; 48(1): 215-222. Du YZ, Wang L, Ye YQ, Yang FL, Hu FQ, Yuan H and Yu HY: Preparation and characteristics of linoleic acid-grafted chitosan oligosaccharide micelles as a carrier for doxorubicin. Colloids Surf B. 2009; 69: 257-263. Zhang J, Chen XG, Sun GZ, Huang L and Cheng XJ: Effect of molecular weight on the oleoyl-chitosan nanoparticles as carriers for doxorubicin. Colloids Surf B. 2010; 77: 125-130. Jiang GB, Quan D, Liao K and Wang H: Preparation of polymeric micelles based on chitosan bearing a small amount of highly hydrophobic groups. CarbohydrPolym. 2006; 66: 514-520. Li Z, Du Y, Zhang Z and Pang D: preparation and characterization of CdS Quantum dots chitosan biocomposite. Reactive functional polymer. 2003; 55: 35-43. Santosh JC, Mansur AA and Mansur HS: One-Step Biofunctionalization of Quantum Dots with Chitosan and N-palmitoyl Chitosan for Potential Biomedical Applications. Molecules. 2013; 18: 6550-6572. Shafiq M, Yasin T, Rafiq MA and Shaista: Structural, Thermal, and Antibacterial Properties of Chitosan/ZnO Composites. Polymer composites. 2014; 35(1): 79-85. Crini G, Torii G, eurinii M, Morcelet M, Weltrowski M and Martel B: NMR characterization of N-Benzyl sulfonated derivatives of chitosan. Carbohydrate polymer. 1997; 33: 145-151. Weltrowski M, Martel B, Morcellet M: Chitosan N-Benzyl Sulfonate Derivatives as Sorbents for Removal of Metal Ions in an Acidic Medium. Journal of applied polymer science. 1998; 59(1): 647-654. Rabea EI, Badawy MEI, Steurbaut W and Stevens CV: In vitro assessment of N-(benzyl) chitosan derivatives against some plant pathogenic bacteria and fungi. European Polymer Journal. 2009; 45: 237-245. Souza MP, Vaz AFM, Correia MTS, Cerqueira MA, Vicente AA and Carneiro-da-Cunha MG: Quercetin-Loaded Lecithin/Chitosan Nanoparticles for Functional Food Applications. Food Bioprocess Technol. 2014; 7: 1149-1159. Li Q, Zhou J and Zhang L: Structure and properties of the nanocomposite films of chitosan reinforced with cellulose whiskers. J. Polym. Sci. Pol. Phys. 2009; 47: 1069-1077. Thostenson ET, Li C and Chou TW: Nanocomposites in Context. Compos. Sci. Technol. 2005; 65: 491-516. Moridi Z, Mottaghitalab V and Haghi AK: A Detailed Review of Recent Progress in Carbon Nanotube/Chitosan Nanocomposites. Cellulose Chem. Technol. 2011; 45: 549-563. Carsona L, Kelly-Browna C, Stewarta M, Okib A, Regisfordc G, Luod Z, Bakhmutove VI: Synthesis and characterization of chitosan–carbon nanotube composites. Mater Lett. 2009; 63: 617-620. Azeez AA, Rhee KY, Park SJ, Kim HJ and Jung DH: Application of cryomilling to enhance material properties of carbon nanotube reinforced chitosan nanocomposites.Composites: Part B. 2013; 50: 127-134. Lau C and Cooney MJ: Conductive Macroporous Composite Chitosan-Carbon Nanotube Scaffolds. Langmuir. 2008; 24: 7004-7010. Travan A, Pelilo C, Donati L, Marsich E, Benincasa M, Scarpa T, Semeraro S, Turco G. Gennaro R and Poaletti S: Non-cyctoxicity silver nano particle–polysaccharide nanocomposites with anti-microbial activity. Biomacromolecules. 2009; 10: 1429-1435. Li Q, Zhou J and Zhang LJ: Structure and properties of the nanocomposite films of chitosan reinforced with cellulose whiskers. Polym. Sci. B. 2009; 47: 1069-1077. Liu C and Hu J: Direct electrochemistry of hemoglobin entrapped in composite electrodeposited chitosan–multiwall carbon nanofiber tubes and nanogold particles membrane and its electrotalaysis application. Electroanalysis. 2008; 20: 1067-1072. Qing-Lin S, Yu S, Hong-Fang Z and Bin ZJ: Direct elelectrochemistry of glucose oxidase immobilized on chitosan-gold nanoparticle composite film on glassy carbon electrodes and its biosensing application. Chinese J. Chem. 2008; 26: 1244-1250. Banerjee M, Mallick S, Paul A, Chattopadhyay A and Ghosh SS: Heightened reactive oxygen species generation in the microbial activity of a three component iodinated chitosan-silver nanoparticle composite. Langmuir. 2010; 26: 22-27. Murugadoss A, Goswarni P, Paul A and Chattopadhyang A: Green chitosan bound silver nanoparticles for selective C–C bond formation via in situiodination of phenols. J. Molec. Catalysis A. 2009; 304: 153-158. Twu YK, Chen YW and Shih CM: Preparation of silver nanoparticles using chitosan suspensions. Powder Technol. 2008; 185: 251-257. Shi W and Ma Z: Amperometric glucose biosensor based on a triangular silver nanoprisms/chitosan film as immobilization matrix. Biosens. Bioelect. 2010; 26: 1098-1103. Borchard G, Junginger HE: Modern drug delivery applications of chitosan. Advanced Drug Delivery Reviews. 2001; 52: 103-150.
carboxymethylated chitosan solution. J. Nanopart. Res. 2008; 10: 1193-1202. Julkapli NM, Akil HM and Ahmad Z: Preparation, Properties and Applications of Chitosan-Based Biocomposites/Blend Materials: A Review. Composite Interfaces. 2011; 18: 449-507. Yeng CM, Husseinsyah S and Ting SS: Modified Corn Cob Filled Chitosan Biocomposite Films. Polymer-Plastics Technology and Engineering. 2013; 52: 1496-1502. Zhang Y, Wang D, Liu B, Gao X, Xu W, Liang P and Xu Y: Adsorption of Fluoride from Aqueous Solution Using Low-Cost Bentonite/Chitosan Beads. American Journal of Analytical Chemistry. 2013; 4: 48-53. Meng Q, Heuzey MC and Carreau PJ: Hierarchical Structure and Physicochemical Properties of Plasticized Chitosan. Biomacromolecules. 2014; 15 (4): 1216–1224. Brack HP, Tirmizi SA and Risen WM: A spectroscopic and viscometric study of the metal ion-induced gelation of the biopolymer chitosan. Polymer.1997; 38: 2351-2362. Monteiro OAC and Airoldi C: Some studies of cross linking chitosan-glutaraldehyde interaction in a homogeneous system. Int. J. Biol. Macromol. 1999; 26 (2-3): 119-128. Arguelles-Monal W, Goycoolea FM, Peniche C, Higuera-Ciapra I: Rheological study of the chitosan/glutaraldehyde chemical gel system. Polymer Gels & Networks. 1998; 6: 429-440. Maity J and Ray SK: Enhanced adsorption of methyl violet and congo red by using semi and full IPN of polymethacrylic acid and chitosan. Carbohydrate Polymers. 2014; 104: 8-16. Dilmi A, Bartil T, Yahia N and Benneghmouche Z: Hydrogels Based on 2-Hydroxyethylmethacrylate and Chitosan: Preparation, Swelling Behavior, and Drug Delivery. International Journal of Polymeric Materials and Polymeric Biomaterials. 2014; 63(10): 502-509. Ma X, Deng J, Du Y, Li X, Fan D, Zhu C, Hui J, Ma P and Xue W: A novel chitosan-collagen based hydrogel for use as a dermal ﬁller: initial in vitro and in vivo investigations. Journal of Materials Chemistry B. 2014; 2: 2749-2763. Ramesh S, Rajagopal K, Vaikkathm D, Nair PD and Madhur V: Enhanced encapsulation of chondrocytes within a chitosan/ hyaluronic acid hydrogel: a new technique. Biotechnol. Lett. 2014; 36(5): 1107-11. Lee SY, Pereira BP, Yusof N, Selvaratnam L, Yu Z, Abbas AA and Kamarul T: Unconfined compression properties of a porous poly(vinyl alcohol)-chitosan-based hydrogel after hydration. Acta Biomater. 2009; 5: 1919-1925. Liang Y, Liu WS, Han B, Yang C, Ma Q, Song F and Bi Q: An in situ formed biodegradable hydrogel for reconstruction of the corneal endothelium. Colloids Surf B. 2011; 82: 1-7. Tan HP, Chu CR and Marra KG: Injectable in situ forming biodegradable chitosan-hyaluronic acid based hydrogels for cartilage tissue engineering. Biomaterials. 2009; 30: 2499–2506. Muzzarelli RAA: Chitin and its derivatives: New trends of applied research. Carbohydrate Polymers. 1983; 3(1): 53-75. Khoshgozaran-Abras S, Azizi MH, Hamidy Z and Bagheripoor-Fallah N: Mechanical, physicochemical and color properties of chitosan based-films as a function of Aloevera gel incorporation. Carbohydrate Polymers. 2012; 87(3): 2058-2062. Shahidi F and Abuzaytoun R: Chitin, Chitosan and Co-Products: Chemistry, Production, Applications, and Health Effects. Advances in Food and Nutrition Research, Academic Press. 2005; 49: 93-135. Shahidi F, Arachchi JKV and Jeon YJ: Food applications of chitin and chitosans. Trends in Food Science and Technology. 1999; 10(2): 37-51. Butler BL; Vergano PJ, Testin RF, Bunn JM and Wiles JL: Mechanical and Barrier Properties of Edible Chitosan Films as affected by Composition and Storage. Journal of Food Science. 1996; 61(5): 953-956. Aider M. chitosan application for active biobased films production and application in food industry: review. Food science and technology. 2010; 43: 837-842. Luo Y; Wang Q: Recent Advances of Chitosan and Its Derivatives for Novel Applications in Food Science. J. Food Processing & Beverages. 2013; 1(1): 1-13. Otles S and Otles S: Focus on principle packaging of biobased packaging material for food industry. Acta Sci. Pol. Technologia Alimantaria. 2004: 3(2): 5-12. Chun KS and Husseinsyah S: Polylactic Acid/Corncob Eco-Composites: Effect of New Organic Coupling Agent. Husseinsyah S, Amri F, Husin K and Ismail H: Mechanical and Thermal Properties of Chitosan-Filled Polypropylene Composites: The Effect of Acrylic Acid. Journal of Vinyl & Additive Technology. 2011; 125-131. Ahmed S and Ikram S: Chitosan & Its Derivatives: A Review in Recent Innovations. Int J Pharm Sci Res2015; 6(1): 14-30.doi: 10.13040/IJPSR.0975-8232.6 (1).14-30. All © 2013 are reseved by International Journal of Pharmaceutical Sciences and Research. This Journal licensed under a Creative Commons Attribution-NonCommercial-ShareAlike 3.0 Unported License.